Lagerfeld is well known for his love and frequent use of blacks and whites in his collections, particularly black – but this season he seems to have turned a new corner and we see it in his Spring/Summer 2010 Couture collection. With not a single black evening dress in sight on Chanel’s SS/10 Couture runway, we took a strong vibe from the King of fashion himself that colour is the way to go for next season and we’re not just taking beautiful and bold bright but shades that make your mouth water because they make you think of sherbet, candy and cake frosting. Chanel’s Spring/Summer runway featured evening dresses in acid yellow, candy-pink, fluorescent lime hues, champagne and cream; and those are the one’s that we will be keeping an eye out for and clashing or coordinating with next season. The collection named ‘Neon Baroque’ presented some highly impeccable work of craftsmanship and we love the re-vamped tailored pieces and the drift from the classic Chanel but still maintaining a reference to the brands signature. It was a mix of romanticism meets space-age and the detailing against the palette looked magnificent. Silver thread ran through the seems of the collection pieces like hot mercury and thousands of handmade silk roses cascaded as a cape over a silver-jewelled shift. The Chanel girl looked super-sweet in this collection but also young, sophisticated and elegant. A young girl with nothing but class and great taste in clothing. Lagerfeld really hit all the right notes with this one and we absolutely can’t wait to strip-off winter’s dark and glummy shades in exchange for dresses in pretty pastels and powdery shades. 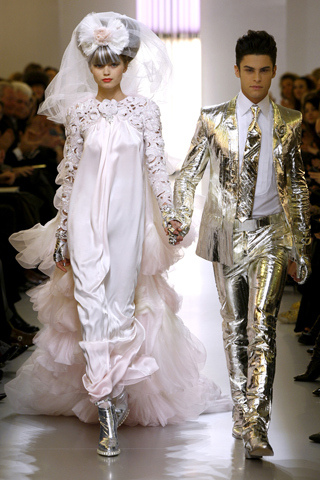 As for the grand finale, a groom in a metallic silver suit steps out to walk his bride down the runway in a silk ball gown with a jewelled bodice and sleeves followed by metres and metres of gorgeous tulle caressed into ruffled clouds forming the train. Tags: Catwalk Reports. Chanel, Couture Spring/Summer 2010, Dresses, Evening Dresses, Karl Lagerfeld. We are excited to announce the arrival of 4 new HERVE LEGER dresses to Girl Meets Dress. By smoothing and shaping women’s bodies, Herve Leger dresses create a sensuous and feminine silhouette. The body-shaping cut of each item, characterized by the aptly named “bandage dress,” sculpts the woman’s body to perfection. Created for a glamorous and sophisticated woman, the Herve Leger woman knows she will make an unforgettable statement, whether walking the red carpet or simply painting the town red. With so many different styles and colours to choose from, and price tags hovering around the £2,000 mark, borrowing is the perfect solution to banish indecision, and now that you can try them all and feel amazing whatever upcoming events you have planned this summer. We have something to suit every occation – black strapless mini dress for those party nights, or Fushia short sleeved for a city wedding or weekend break, an asymmetrical gold dress for cocktail hour, and a fresh green halterneck to attend a dinner date, the races or a work party. Since its inception in 1985, the striking and sensual style of Herve Leger has attracted an international clientele consisting of the world’s most beautiful and fashionable women. Hollywood stars including Sharon Stone, Lindsay Lohan, Catherine Zeta-Jones, Charlize Theron, Beyonce Knowles, Eva Mendes, Nicole Richie, Eva Longoria and Jessica Biel, to name a few, have become some of the label’s most devoted fans. The stars turned out for the red carpet in LA last night for the 16th Annual Screen Actors Guild Awards and here are some of our fashion favourites from the night. Christina Applegate stepped out in this gorgeous Roberto Cavalli dress. The dress was pale blue, floor length and had stunning Swavorski crystal detail. She sashayed down the red carpet looking simply stunning. Marion Cotillard caught our eye once again, she always seems to hit the right notes with her red carpet designs and she didn’t disappoint us on this occasion. The white dress was designed by Elie Saab. Elie Saab also seems to be getting it right every time we see one of her amazing creations on the red carpet. The one shouldered dress was short with amazing sparkly detail and feathered trim. Sandra Bullock went for black by Alexander McQueen. The dress was floor length with structured shoulders and blue detail and she carried off the British designers look perfectly. Last night The National Television Awards took place at the O2 Arena in London. All the television stars turned out for the red carpet and here are some of our favourite dresses of the night. Kara Tointon was the first we noticed in an amazing and extremely elegant Alexander McQueen Dress. The dress was black and had gorgeous lace detail at the front and a clinching waist belt. We thought this dress was stunning and one of the fashion winners of the night. Cheryl Cole also looked gorgeous in another floor length dress by Stephane Rolland. The chiffon dress with its sparkly detail also had a waist clinching belt which had lovely detail on the front. One of the colours many of the stars wore to the awards last night was purple. The best dressed in purple award went to Fearne Cotton who wore a short cute number from her own Fashion line she designed for Very. The dress had a plain front but had a cut out back with bow details which made the dress stand out. If there were any other dresses that you loved let us know!